Although the dates coincide with our Halloween, the Day of the Dead is absolutely not about being scared of spooky ghosts and ghouls – it is a celebration of life! 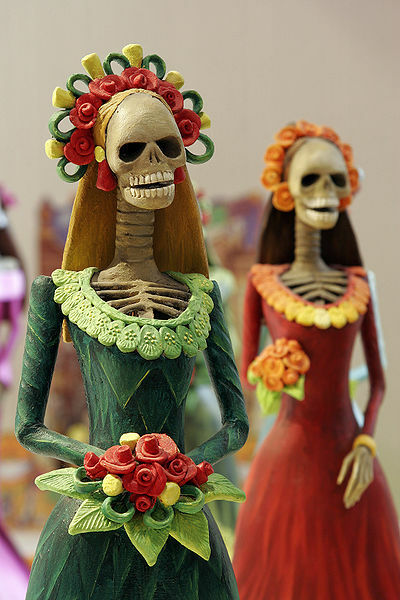 The Day of the Dead is a festival celebrated throughout Mexico on 31st October, 1st & 2nd November, families and friends get together to remember those who have died. Over the last four years, as Richard and I have learnt more about Mexican culture, we have come to look forward to the Day of the Dead and really appreciate the sentiment behind it. 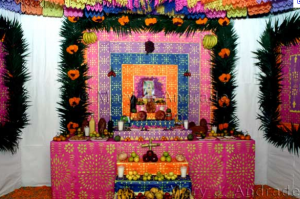 Altars – or ofrendas – are built to commemorate the deceased, often decorated with sugar skulls and marigolds. Families bring favourite drinks and food to the altar, so that when the spirit of their loved one returns on these special days they can be refreshed. Vigils are sometimes held at gravesides during this time, giving the cemeteries a bit of a party feel! We built our own ofrenda, specifically to remember Richard’s Mum, who passed away 20 years ago, it gave real meaning to the day as we added a lemon and some gin and tonic to our carefully created altar! This is the altar that was built in the Cantor Building this year as part of the cultural celebration. Although the day of the Dead is celebrated in many cultures around the world, it’s traditions are firmly rooted in Mexican history. 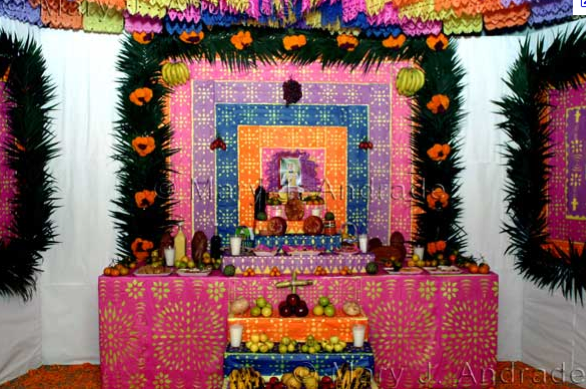 During the time of the Aztecs, a month long summer celebration was overseen by the goddess Mictecacihuatl, the Lady of the Dead. After the Aztecs were conquered by Spain and Catholicism became the dominant religion, the customs became intertwined with the Christian commemoration of All Saints’ Day on Nov. 1. I am hoping that if any of our Mexican friends read this and want to add or amend anything, they will do so in the comments box!